From the Adafruit Forums: Trinket Extravaganza! #trinket « Adafruit Industries – Makers, hackers, artists, designers and engineers! It’s cool just how much you can hang off a Trinket! 23K256 SRAM Chip – 32K of lovely SPI accessible memory. The SRAM provides a screenbuffer for the OLED module, which has no built in RAM. To draw the buffer to the display I read a ‘page’ worth of data (128 Bytes) at a time from the framebuffer and push these to the OLED, both over SPI. So a local 128 byte buffer is needed in the Trinket. All the Trinket pins are in use so I use a small switch to disconnect #3 and #4 during proramming. With SPI you need a separate Slave Select line for each device. These are provided by the PCF8574 which is an I2C IO Expander. I write to this first (over I2C) to select one of the output pins which act as Slave Selects for each SPI device. The outputs (I’m using 2) are then AND’ed with a single Master SS (on #3). This allows the individual SS’s to be driven low by the master SS. Code eequires a bit of jumping between I2C mode and SPI mode and both are using the serial hardware on the ATTiny. The display in the photo shows the time, a compass reading and a time per frame in milliseconds. So it’s running about 13fps with room for optimisation. 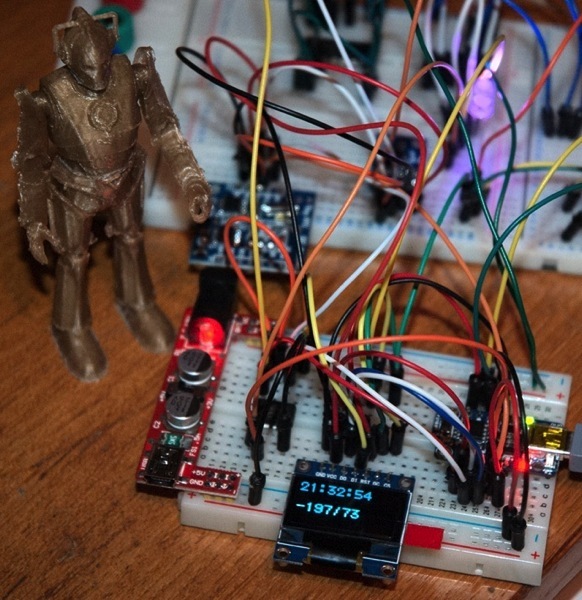 So all the chips you see are either I2C and SPI apart from a single 2-input AND gate, and the Cyberman….